Previously, we’ve given you our thoughts while re-watching the first three Harry Potter movies: Sorcerer’s Stone, Chamber of Secrets, and Prisoner of Azkaban. Today, I’m giving you the 17 thoughts I had while re-watching the fourth movie of the series – Harry Potter and the Goblet of Fire. 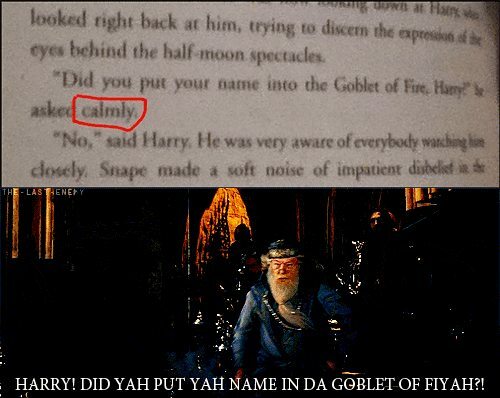 Many people say that Goblet of Fire is their least favorite movie for many reasons. Often, I hear that it’s the one with the worst acting. Other times, I hear that it’s so unlike the book that it’s unbearable to watch. Most of the time, though, people just call it a mess. However, I found that while there were many times that the movie didn’t follow the book, I thoroughly enjoyed re-watching this movie and noticed things that I’d failed to notice before. I even laughed to the point of tears during certain scenes! Here are my 17 thoughts while re-watching Goblet of Fire! When reading the books, it’s obvious that Harry Potter and the Goblet of Fire is significantly darker than the first three. When I watched this movie again, I was slightly overwhelmed with how mysterious and dark the Warner Bros. introduction actually is. No longer was the happy, magical music playing with the introduction of the movie that signified what adventure was about to come. Instead, menacing violins and pounding drums welcomed the twist that the story was going to take. Whenever I watch this movie, one of the first things I think is that many of the actors had ridiculous hairstyles. Maybe the shaggy hairstyles were popular during this time, but I can never quite fathom why almost every boy had long hair — Harry, Ron, Fred, and George were all victims of the long hairstyles. Throughout the movie, it became bearable, but nevertheless, I really wanted someone to take a pair of scissors to their hair and make the actors at least somewhat presentable. I’d forgotten how much I enjoyed Robert Pattinson in this movie as Cedric Diggory. I found him to be extremely charming — especially since he wasn’t glittering in the sun. To me, the most enjoyable part of this scene was Lucius and Draco Malfoy. Maybe because I’m a Slytherin I’m biased to these two characters, but I think their acting in this scene was completely in character. It seemed to be the most realistic part of the scene. I even rewound the movie just to watch them again. The part about the Quidditch World Cup that bothered me was the fact that it was inconsistent with the book. It seemed to happen extremely fast. Truly, I think more information and scenes could’ve been added here to really capture its significance. Before these two schools entered Hogwarts, Filch came prancing through the Great Hall and told Dumbledore something. I’m not sure whatever was whispered between the two was ever divulged to viewers, but whenever that occurred, I laughed uncontrollably. I still have no clue why it was necessary to the movie. Durmstrang and Beauxbatons’ entrances to the school were slightly awkward, I think. I kept wondering why the ladies of Beauxbatons were moaning and the Durmstrang boys were groaning. There were two parts of this scene that I loved. One was when Hagrid accidentally stabbed Flitwick in the hand, to which Flitwick replied, “You idiot!” The other was when the camera flashed to Snape. The tortured look on his face was hysterical. This scene always makes my emotions flare because I always think about how it was the only time Fred and George got to see each other old. It’s completely heartbreaking to re-watch this scene, knowing that in the end, Fred dies. I’ve never really enjoyed Rita Skeeter, much like many other Harry Potter fans. However, when she interviewed Harry for the first time, I found her performance completely hysterical. I rewound and watched it three times. Did anyone else notice the fact that she looks as though she’s trying to seduce Harry? The entire concept of the Triwizard Tournament bothers me, and to me, it says a lot about Dumbledore as well. Each time there was a task, I kept asking myself, “Why in the world would Dumbledore agree to this?” It seems as though he is vaguely aware that each task is completely and utterly dangerous. If Dumbledore cared so much about his students, why allow them to endure this? Though the participants are obviously witches and wizards, the tasks presented to them seemed too extreme, even for the cleverest of witches and wizards. It’s no secret to anyone who knows me that I love Severus Snape. It’s also no secret that I love Alan Rickman as Severus Snape. When re-watching this movie, I was disappointed at how little Snape was present in the movie. It has, regrettably, been a while since I’ve read the series, but I’m almost positive there was more Snape in the book than there was in the movie. However, whenever Snape was present, he stole the scene — especially when he kept whacking Harry and Ron in the head with the book. That was priceless. Did I mention that I love Snape and Alan Rickman? I really do. Like many other times during the movie, I rewound this scene to watch it… possibly three or four times. I kept laughing! I don’t know if it was the reaction of Ron or McGonagall, but this scene was one of my favorites. I loved how Ron was shocked when McGonagall said to put his hand on her waist, and I loved how McGonagall said so calmly, “My waist,” as if it were the most natural thing in the world for one of her students to put his hand on her waist and slow dance with her. It was beautiful acting and gloriously hilarious. I really wanted that dress to be blue. It just seemed really important to Hermione’s character that the dress was blue instead of pink. Surely I’m not the only Harry Potter fan out there who cracks up at this scene? There are plenty of GIFs floating around on the Internet that have ruined this scene for me. Truthfully, though, the GIFs are correct. When I came upon this scene, I kept laughing at how suggestive Cedric’s face is while he’s telling Harry that the prefects’ bathroom is an excellent place for a bath when speaking of how to solve the riddle within the Golden Egg. His face, his eyebrows, his sly, yet nervous smile, paired with Harry’s incredulous expression add to the glorious suggestiveness of this scene. I loved it. When Harry took Cedric’s advice and took the Golden Egg to the prefects’ bathroom, I felt my skin crawling the entire time for one reason: Moaning Myrtle. Whenever she’s on the screen, I cringe. She’s creepy and makes no secret of her admiration for Harry, Cedric, and many other boys she stalks in the bathrooms. Though she’s a ghost, and she can’t do much harm, she’s still incredibly creepy. Though I’ve seen the movie countless times, I always find myself irritated that there are literally no house-elves present in the movie. In the book, the house-elves, particularly Dobby and Winky, play a huge role. The fact that they are nowhere in this movie, to me, gives it a lack of substance. As fans, we needed more house-elves. This, to me, is one of my favorite moments of the movie. I’m fascinated by Voldemort (I’m a Slytherin), and I love Ralph Fiennes. I think the acting during this scene was incredible. It was the perfect mix of darkness and mystery. In this scene, we get our first view of what is to occur during the remaining years at Hogwarts, and I think it was played out perfectly. I forgot just how creepy Voldemort’s return actually was, and for a few minutes, just looking at Voldemort gave me the creeps. Also, seeing the Death Eaters and their Dark Marks seemed to put everything in perspective. However, I laughed at one particular part. When Voldemort had the perfect opportunity to finally kill Harry once and for all, he decides to boop him on the forehead instead. Obviously, Voldemort wants to kill Harry in a duel to prove that he is the more powerful and capable wizard between the two, but I couldn’t help but burst into laughter when Voldemort just touched Harry’s head and proceeded to laugh. It was ridiculous and in a way, perfectly humorous. This is definitely my absolute favorite scene in the entire movie, and while watching this again for the first time in a few years, I cried. Someone told me awhile ago that the way Amos Diggory wails over his son’s dead body is how a parent actually feels when they lose their child. When Amos rushed down the stairs and yelled, “That’s my boy!” and began screaming while holding onto Cedric’s dead body, I lost it. It was incredible acting and packed with so much emotion. I felt as though I’d been punched in the stomach. My heart broke into so many pieces that I’m still trying to put it back together. It was such a powerfully acted scene filled with emotion that I couldn’t contain my tears. 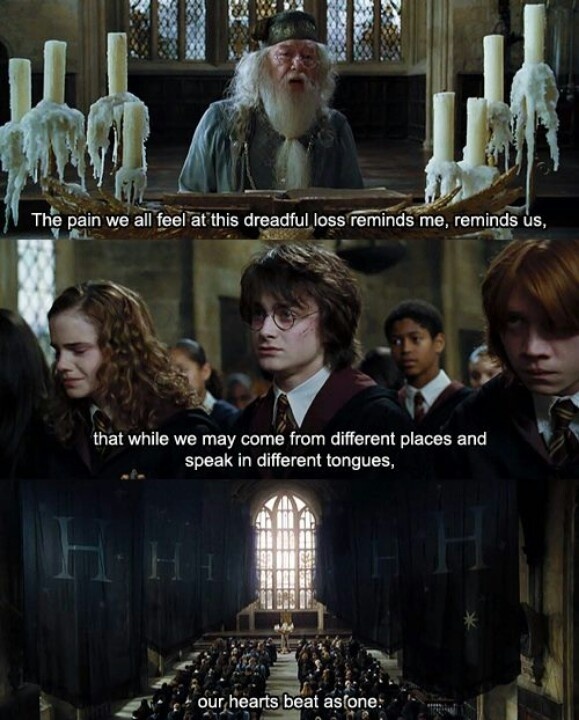 What were some of your thoughts while re-watching Goblet of Fire? Leave your comments below! Which “Potter” Characters Will Stick with Their New Year’s Resolutions? Who Was the Best Voldemort?